There are many ways to get involved and support the hospital charity, whether you are looking to support us individually, with friends or as part of an organisation. If you would like your fundraising to benefit a particular area of the hospital, please let us know so that we can ensure that the money you raise goes to the correct area. We have a wide range of exciting events and activities taking place throughout the year. Check out some of our latest events planned for this year. The fundraising team are here to help if you have any ideas or questions! 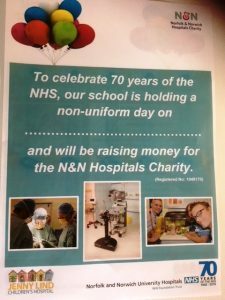 As part of the summer celebrations to highlight 70 years of the NHS, we are inviting schools to hold a non-school uniform day to raise funds for our Jenny Lind Children’s Hospital. er Hospital to mark its 150th anniversary and raise money for charity. The copper structure – which is more than two metres tall – stands just to the side of the hospital’s main entrance. 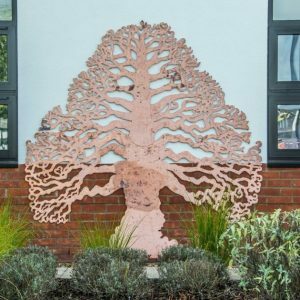 People can sponsor and dedicate either a maple leaf or an oak leaf for £200, which is then personalised with a message and hung on the tree. On Sunday 15th July 2018 cyclists will be taking to the roads of Norfolk for the NNUH Tour Sportive which offers 100, 60 or 30-mile routes, all of which follow sections of the Tour of Britain and the Women’s Tour. All routes start and finish at the hospital on Colney Lane and will take participants through the quiet roads in South Norfolk and North Suffolk, which provide scenic beauty along the way and routes suitable for both experienced and novice cyclists. 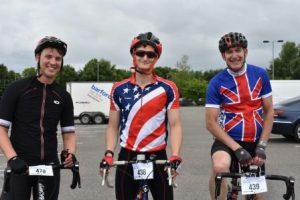 This is one of the few sportives where your entry will directly support the N&N Hospitals Charity as up to £9 per entry goes directly to us, and you can raise further money through sponsorship. To enter, visit the Sportive website here. 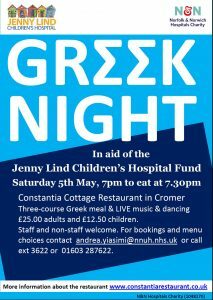 On 5th May The Constantia Cottage Restaurant in Cromer is holding a special night to help raise money for our Jenny Lind Children’s Hospital Fund, part of the N&N Hospitals Charity. Tickets for a 3 course Greek meal are £25.00pp adults and £12.50pp children. Evening starts at 7pm, sitting down to eat at 7.30pm. Help us raise lots of money for the Jenny Lind Childrens Hospital. Open to staff & members of the public. There are many ways to get involved in fundraising for our hospital charity either individually, with friends or colleagues or as a larger group. Here are a few ideas to get you started. Register for one of the many sporting events such as the Bupa10km, Local Triathlons, London Marathon, Great East Swim or Great North Run and nominate NNUH charity as your chosen charity. Anything can be done from a head shave to a walk to a silence to a sit down; if you can think of it, you can do it! Get some friends together and organise a charity ball or auction or a quiz night in your local pub. We have several ‘How To..’ fundraising guides to get you started – just contact us for help. Setting up your own online fundraising page with JustGiving makes it easier for friends, family members and colleagues to make a donation. If you wish to fundraise for a particular area of the hospital, please remember to specify on your fundraising page, so that we can ensure that all money raised goes to the correct area. If you are looking for the opportunity to make a real difference to your local hospital, why not volunteer for us? We are looking for enthusiastic volunteers with a wide range of skills and experience, to help with administrative tasks, at fundraising events, form small local fundraising groups and to help promote the charity. If you enjoy organising events on a regular basis, why not join up with a group of friends and form a volunteer fundraising group? We can provide practical help and support and are looking to set up small groups all over Norfolk. Help us to raise vital funds and awareness, so whilst the NHS provides the necessities, the hospital charity funds projects that make the hospital experience a better one for our patients, visitors and staff. Call 01603 287107 or email fundraising@nnuh.nhs.uk for more information. At the hospital we aim to recognise the support of local companies that help us to continue to improve patient, visitor and staff welfare across our hospitals. By choosing to partner with such a local charity, your company can make a difference where it matters the most. Every single one of your customers, clients, employees or stakeholders is highly likely to have used the services of our hospitals at some points, either for themselves or their loved ones. If they have not yet experienced some form of care, they probably will do in the future. We are keen to work in partnership with schools, colleges and education groups. There are many ways for schools to get involved, whether it is a sponsored event or a non-school uniform day. 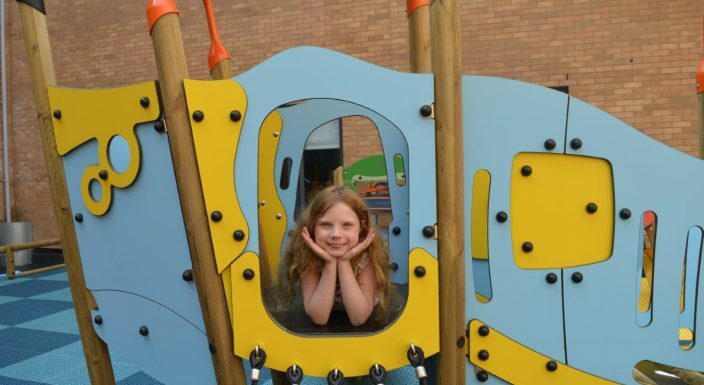 Supporting the hospital is a great way to focus the fundraising efforts of your school, and fundraising activities could be concentrated in a ‘Charity Week’ or spread out across various events throughout the year. We are happy to come along to your school or college and conduct assemblies or class talks for any age group about the work of the hospital charity. We can make these assemblies both educational and fun. We like to publicise and acknowledge events that our supporters organise – the more imaginative the better! This in turn is great PR for your school within the community. There are lots of ways to raise money and we are more than happy to provide you with advice about organising an event. Have a look at the list above to get some ideas! Fancy doing something different? Want to take on a personal challenge and raise money for charity? Then why not take part in a challenge like skydiving, triathlon or marathon running. Each challenge has a minimum sponsorship level (which not only raises money for the charity but also covers the cost of you going on the trip) or a minimum cost you must pay (then you raise as much sponsorship you can). We work with several companies who specialise in giving you an experience of a lifetime while supporting your local hospital, all you need to do is choose your challenge, choose us as your charity and start fundraising.